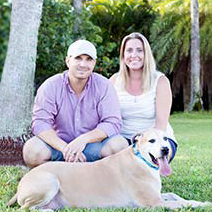 Tara and Geoffrey Moser are a husband and wife team with a passion for rescue animals. Tara is a Licensed Clinical Social Worker and Registered Play Therapist Supervisor with 10 years in private practice in Southwest Florida. Geoffrey is owner and educator at The Beach Dog, a wellness and nutrition based dog and cat supply store. Together they are on the board of directors for Pawsitive Kids Camp and have welcomed over 160 foster dogs to their home along with their own three rescues!